The inaugural Divine Liturgy was held on January 25, 2014. The Church was blessed with the opportunity to lease a room on the second floor of St. Andrew House, Center for Orthodox Christian Studies, Detroit, Michigan. On this day, the Church was blessed to have the presence and support of four priests from St. Mark Coptic Orthodox Church. The sermon was given by Abouna Mark, during which he reminded us of what it means to carry the cross. 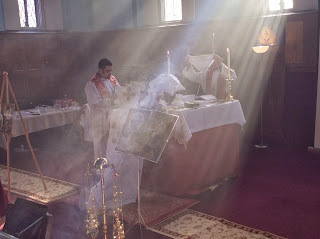 Eighty eight people attended and together celebrated the liturgy. Also present were a few people from St Andrew House who said that they were filled with joy to celebrate the commencement of the new Church. Naming a church is a challenge, as names carry great importance in our society and in our lives. The name, Holy Cross Coptic Orthodox Church, was the result of much thought, contemplation, and prayer as to what would summarize the hopes and intentions of this community. Once selected, the name was submitted to and approved by His Holiness Pope Tawadros II in the request for this church. The Cross is the most clear and recognizable symbol of Christianity and Jesus Christ that exists. Our goal in the formation of this faith community is that it will be a place where all those who enter will encounter Christ, and it is through His suffering and His sacrifice on the Cross, and through the power of the Cross that we can truly do so. Jesus invites all of us to come to Him on the Cross. His arms outstretched, He beckons all people to repent, to follow Him, and to embrace Him: the crucified, risen, Lord. The Cross is the symbol of the triumph of good over evil. By His sufferings on the Cross, our Lord Jesus Christ washed away the sins of all people, conquered the Devil, abolished death, and opened the way to eternal life for us all. The Cross bears witness to God’s infinite love for all people. May all those who enter Holy Cross Coptic Orthodox Church find in it the great power of the Holy Cross of our Lord, God and Savior Jesus Christ. Fr. Raphael was ordained priest at the hands of His Holiness Pope Tawadros II on February 16th 2016 at St. Bishoy's Monestary in Scetis (Western Desert).